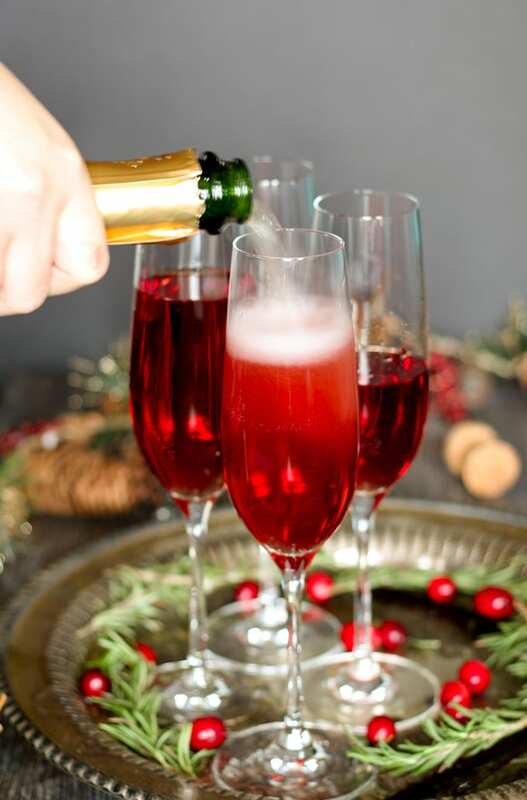 This vanilla cranberry mimosa recipe is perfect for winter brunches, Christmas, and holiday and New Year’s Eve parties! This cocktail recipe only requires 3 ingredients and is very easy to make. Do your plans for the holidays include any parties? Because I have found the perfect winter party cocktail! I think every year I host some kind of holiday gathering. Whether it’s for book club or my family, I love any excuse to have guests over. Thankfully, the holidays give you many reasons to invite over your friends and family. I also love making fun cocktails specifically for my gatherings. Sure, I could just open up some wine and leave it at that but I think it’s so much more fun to create a signature cocktail. 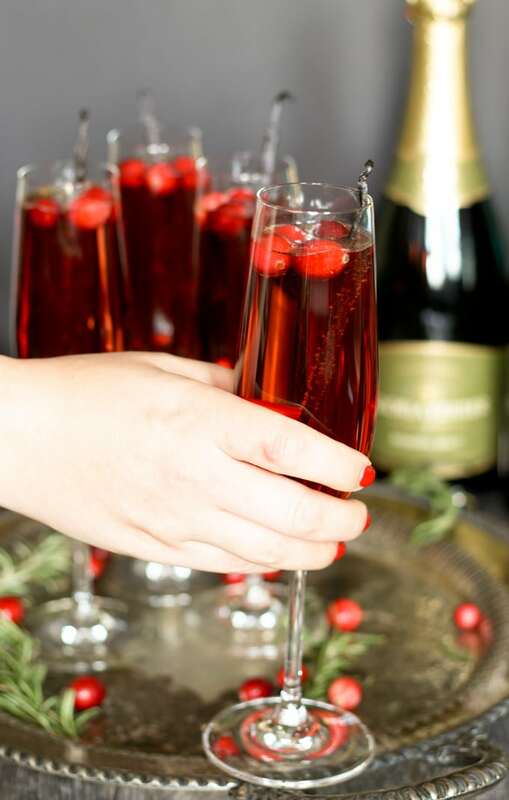 This year one of my signature cocktails is this fun and festive vanilla cranberry mimosa, made with sparkling wine. This super fun and easy cocktail consists of one of my all-time favorite flavor combinations – vanilla and cranberry. I often will order a cranberry and vanilla vodka when I am out on the town with my friends and that was the inspiration for this drink. To prepare this easy winter drink, I like to use a cocktail shaker to chill the vanilla vodka and cranberry juice. If you don’t have one, no worries – just refrigerate all of your ingredients beforehand. This can also easily be made into a holiday punch. 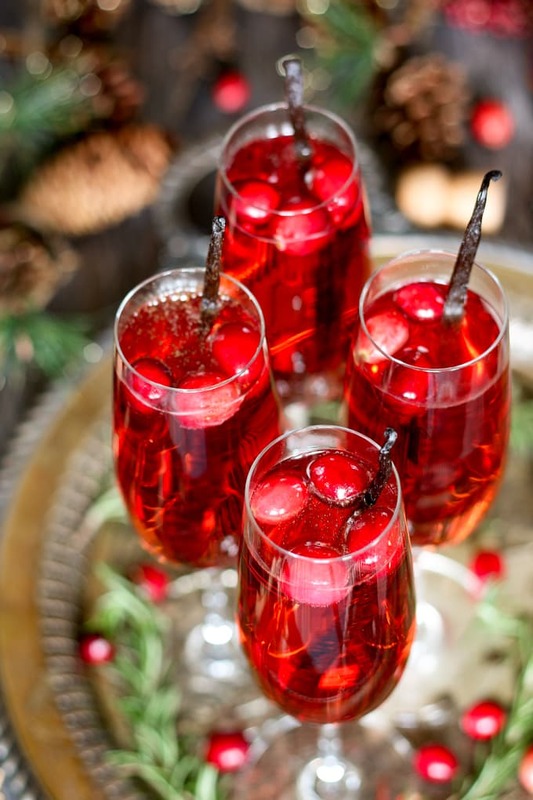 All you have to do is multiply the cranberry juice and vanilla vodka by 6 and use an entire bottle of sparkling wine. This cranberry mimosa is perfect if you’re looking for holiday drinks with vodka. 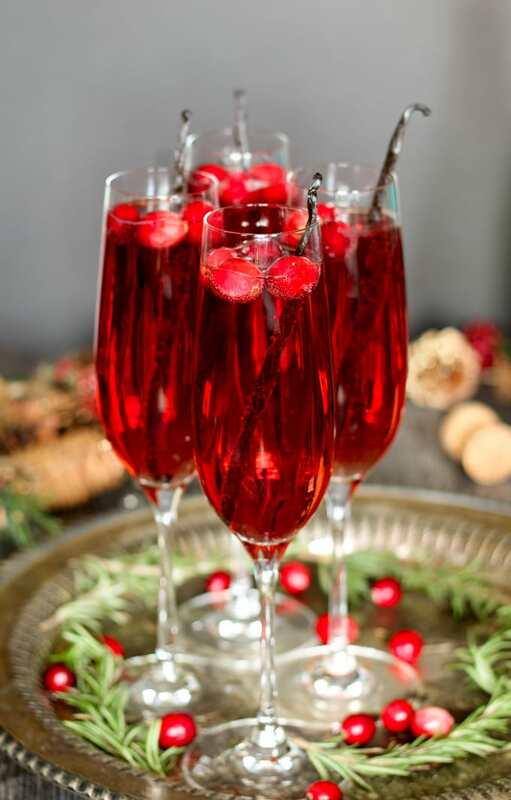 Cranberry cocktails are fun year-round but they are especially great for Christmas. Also, if you have a bottle of vanilla vodka laying around this is going to be your new go-to vanilla vodka cocktail. You don’t need fancy tools for this recipe – just a cocktail shaker and some glasses. And if you don’t have a cocktail shaker, don’t fret. 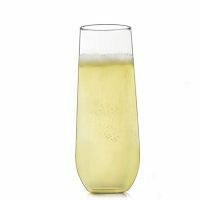 What type of glass should a mimosa be served in? 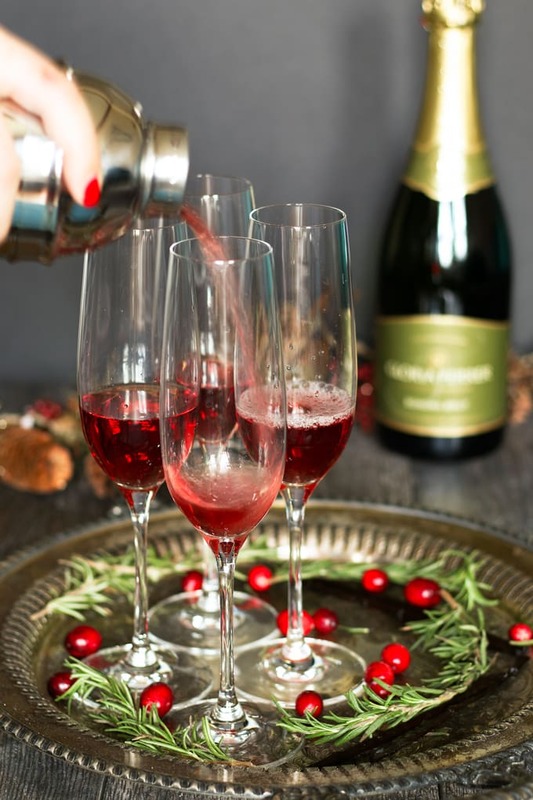 Speaking of glasses, you may be wondering what you should serve a vanilla cranberry mimosa in. 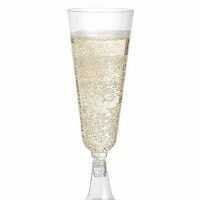 Champagne flutes are the go-to glass for mimosas. 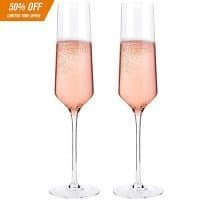 If you’re serving this cocktail at a party, you may want to consider getting plastic stemless flutes. There are a lot of really pretty options out there. Another option is a wine glass. Again, I would recommend a plastic stemless glass for a party. And if you’re in a pinch and you really want a cranberry mimosa, any old glass will do. Don’t forget – it’s your party. 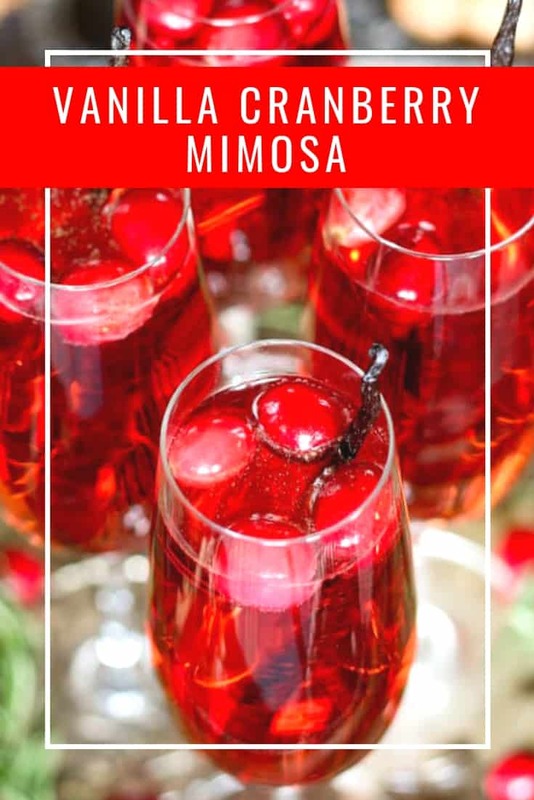 This vanilla cranberry mimosa recipe is perfect for winter brunches, Christmas, and holiday and New Year's Eve parties! This cocktail recipe only requires 3 ingredients and is very easy to make. In a cocktail shaker, combine the vanilla vodka, cranberry juice and ice. Shake vigorously, then strain into a champagne flute. Fill the glass to the top with sparkling wine. Garnish if desired. Garnish if desired with cranberries and whole vanilla beans. This apple cinnamon cranberry mimosa can easily be made into a fauxmosa! or my recipe for winter sangria! I’ve always put cranberry juice in my mimosas instead of orange but I LOVE the addition of vanilla! I hope you like them as much as I do! Thanks Sharon! Lol, I hear you! I love New Year’s Eve! Such a pretty and festive drink! A perfect addition to any holiday party! I can just imagine how wonderful this cocktail is. The combination along with the sparkling wine sounds delicious. You cn bet I will be making these this year. I hope you like them! Thanks Ginny! Jenny, what a wonderful cocktail to celebrate this holiday season with! Beautiful ruby color is so appealing. You had me at 3 ingredients! I love a pretty holiday drink. Can’t wait to try these, Jenny! Thanks Ashlyn, I hope you like them as much as me! I love the sound of these! What a great idea to use vanilla to cut the cranberry flavor! Wow, I bet these are so delicious and they are SO pretty and festive! What a gorgeous post! I only have a bottle of champagne. Do you think that would work? wow! Gorgeous photos! They look so delicious. Thank you for sharing on Bewitchein’ Projects! I will be featuring these tomorrow on Bewitchin’ Party at Savvy in the Kitchen! 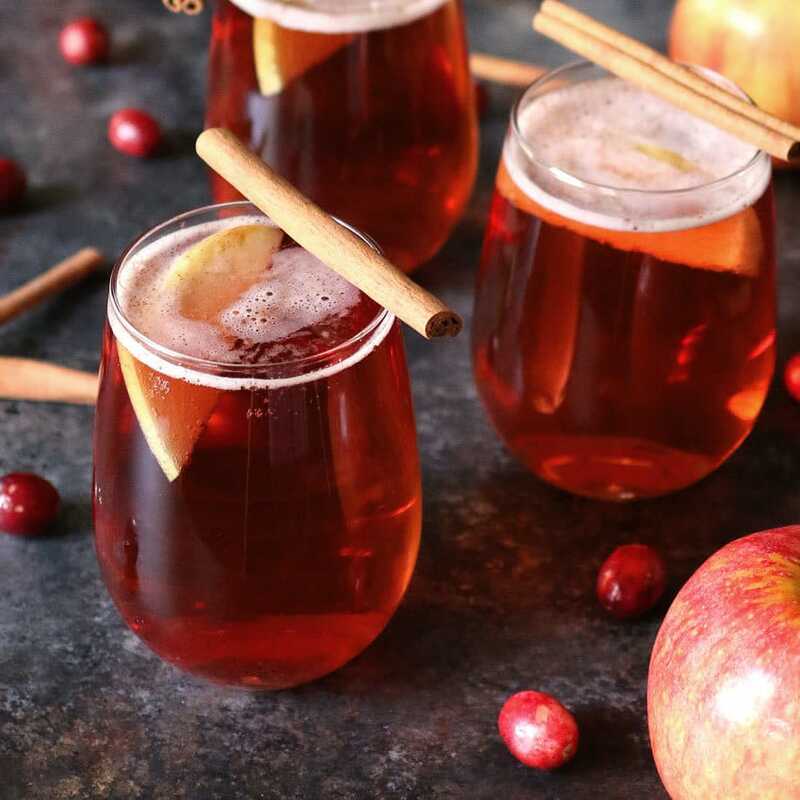 Not only do these drinks look absolutely delicious, they’re perfect for the upcoming holiday season! Thanks so much for sharing at our Share The Wealth Blog Hop! I’ve chosen this post as one of my features for the next party. What a beautiful drink! Thanks for sharing on the What’s for Dinner Link up! These will be joining me at my thanksgiving table, for sure! This looks really good. I haven’t found a wine that I like yet, but this looks promising. Thank you for sharing this with us on the #HomeMattersParty. We hope to see you when we open our doors next Friday at 12 AM EST. 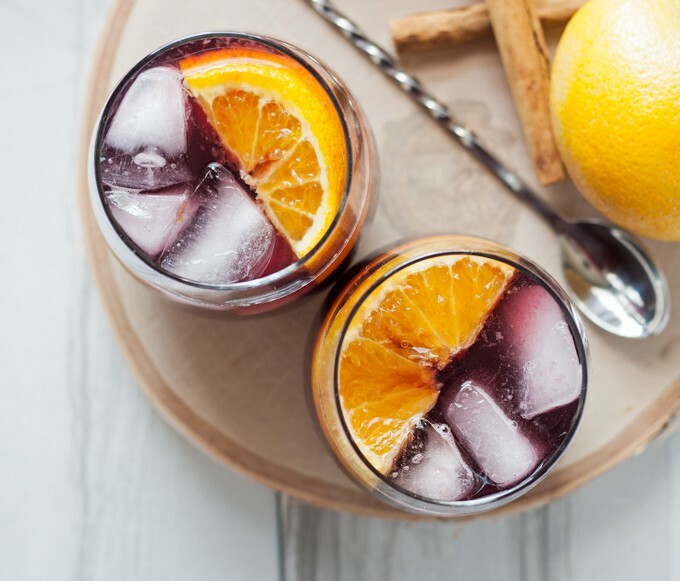 Perfect for the holidays, I always love your drink recipes! Going to serve this at a party next week! Thanks. 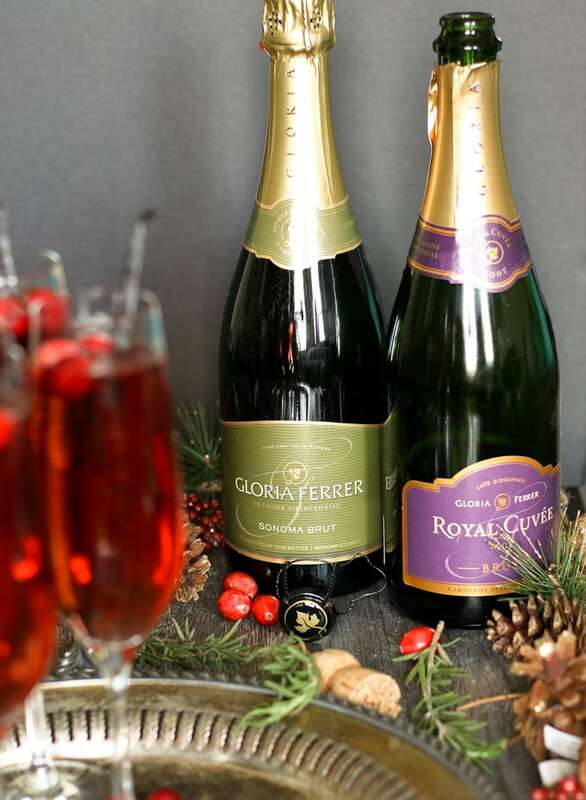 I LOVE Gloria Ferrer sparkling wine! I was out in Sonoma a few years ago and actually had the chance to tour the winery and see how they make their sparkling wines! 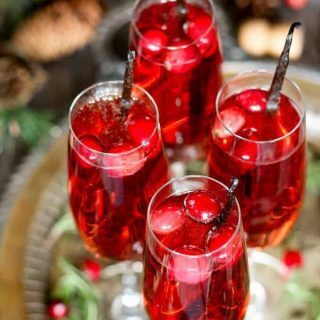 This cocktail looks amazing, so festive and perfect for a holiday celebration! What a beautiful drink for the holidays! What a gorgeous mimosa! Love champagne cocktails. This one is DEFINITELY perfect for the holidays. I like how you’re thinking ahead, what a fun and festive cocktail! Happy Holidays to you – cheers!! 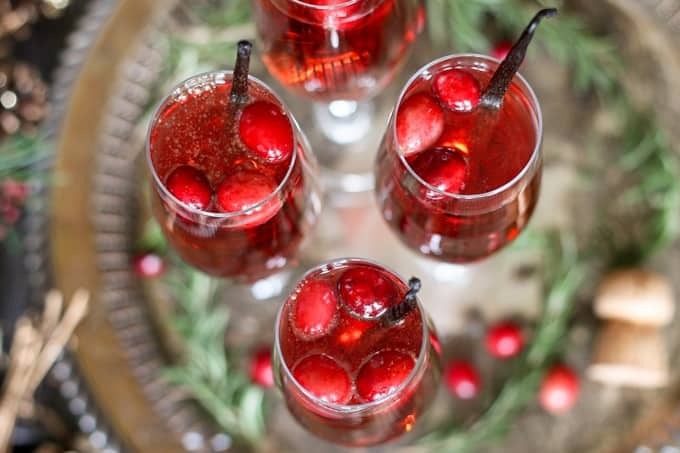 Clearly, you have hit a holiday home run with this gorgeous and festive libation. 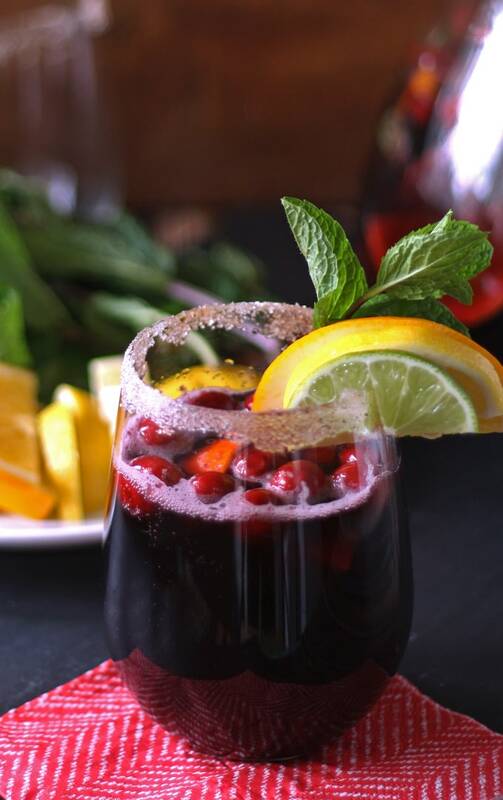 I particularly love your use of cranberries in this beverage, they are so versatile yet so under-appreciated in the kitchen. Thanks for this wonderful idea! What a fun and festive drink! I love how pretty it is! I love creating signature drinks. This one is perfect for Christmas brunch or a gals gathering or….I have so many options 🙂 Thanks for a great recipe! I am loving this cocktail, Jenny! These would be perfect for holiday entertaining! This is going on my must make list for the holidays!! What perfect cocktails! This is gorgeous for any party but those colors are screaming Christmas and New Year’s Eve! I’ll be the hit of the party! Just wanted you to know that I used this recipe over on my blog today, looks so delish! I linked it back to you here, thanks for such a great post! Thank you for letting me know! Happy holidays! Very festive looking drink. If i multiply the vodka and juice by 6, how many people do you think it will serve? Can’t wait to try. Hi Kris! The recipe amounts are for 1 drink, so if you multiply it by 6, you would have one drink per person. Each bottle of champagne is enough for 3-4 drinks, depending on your glass size and how high you fill it up. I hope that helps! Did you use cranberry juice or cranberry juice cocktail? I have used both but prefer the cranberry juice cocktail or a non-100% juice cranberry juice that is less tart. Could this work well with making a simple syrup with cranberries instead of using juice? I am going to try this, but I’m wondering…can you freeze the cranberries? I’ve never used fresh cranberries with anything before so I don’t know how they would hold up being frozen. I’m just thinking that would be nice to keep the drink cool. ???? I’ve never used frozen cranberries but I agree – it would be like adding ice! Any suggestions about how to make it ‘non’ alcoholic ? I can substitute sparkling water for the champagne. What can I substitute the vodka with? Or, do you have a recipe for a non alcoholic vanilla, cranberry punch – and to complicate matters even more, I am in the UK. Hi Wendy! I would use sparkling water instead of sparkling wine. 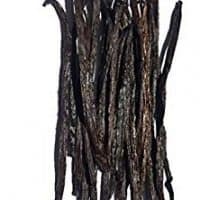 The vodka will be a little trickier – you could make a vanilla simple syrup (water, sugar, and a vanilla bean cut open heated and then cooled.) You might need to add a lot more sparkling water but I think it will work! This looks so good!!! Fresh and delicious. Love the color too.